A retainer agreement can keep your freelancing business profitable. Obviously, that statement may sound exaggerated to you, but that shouldn’t be the case if you think about it well. One, you need a good understanding of the purpose of the retainer agreement and why your business needs it. The economic stability and success the agreement brings to your freelancing business remain unmatched by other documents. First, you need to appreciate what this agreement is. 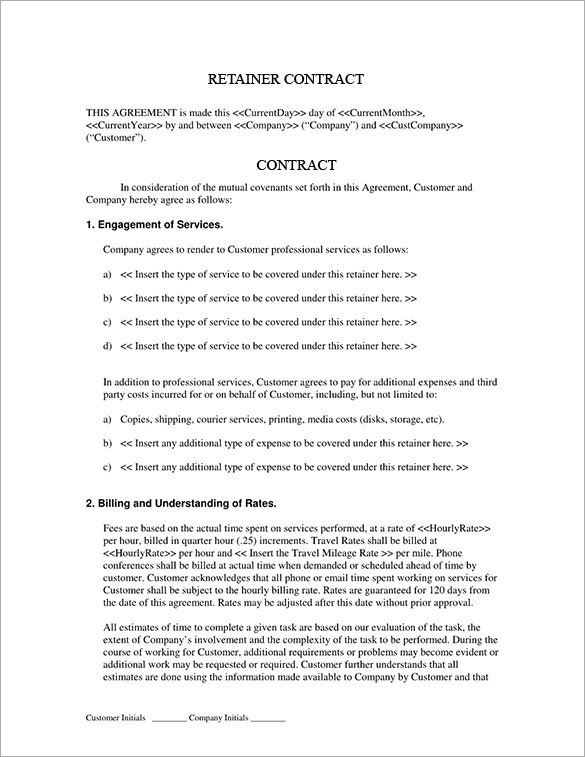 A retainer agreement is a contract signed between the client and freelancer in which the former commits to paying the latter a certain amount of money each month. The two parties can agree on a retainer based on the project scope or a specific amount of hours. The terms of the agreement vary depending on many factors. For the most part, however, the contract runs for 6-12 months. Now that you understand what it can do, it should be pretty obvious to you what the retainer agreement sample is. 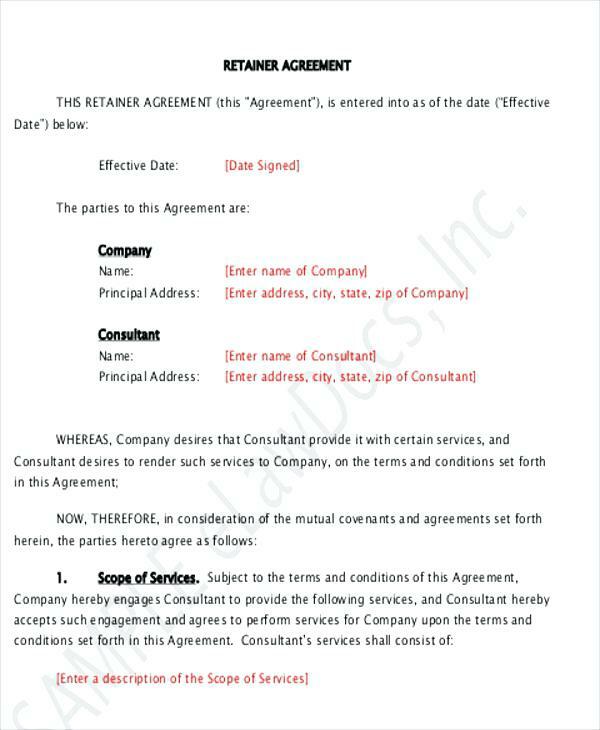 The sample shows you the type of agreement you should prepare or expect to sign, especially if you are unfamiliar with such contracts. It helps to study the agreement closely so you know its most important segments, as that could be the difference between profitability and losses for your business. When followed religiously, the retainer agreement sample can bring in more efficiency and accuracy to your business. The accuracy will be more evident in your monthly income projections. Financial projections are important to a business in many ways. They are essential for proper planning. In freelancing, you can’t run your business without any planning. You have to put measures in place to help the business grow in size, number of clients and revenue. On top of that, the agreement is also essential for controlling workflow. It also helps the business owner to manage their work schedule better. The fact you know that a specific amount of work is available and payment shall come in religiously like clockwork, you can organize the schedule and roster of the individuals working for you. It helps you to manage your time more efficiently too. Poor time management can cause businesses to collapse. Poor time management can lead to tons of conflicts for your business. If left unresolved, it can also eventually kill your business. It causes distractions and loss of work. Missed deadlines and massive financial losses become the norm as you continue mismanaging time. The relationships with your clients – coupled with the ones you have within the business – also suffer deeply. A retainer agreement can help you to avoid all these business-crippling behaviors. Consistent flow of cash into your business can also increase your profits. In some cases, it can be more important than profits. Yes, the retainer agreement sample guarantees you a monthly income for several months – usually 6-12 as previously stated. You can then plan your work properly fully assured that money to cater for any forthcoming expenses will come in. You can also recruit new members of your workforce in case the project demands more hands. However, it’s important to note that the benefits do not just happen automatically without your input. You have to know how to use the retainer agreement sample properly. You have to know how to prepare it too. More importantly, restrict yourself to what the agreement says. Use it to determine the course of action you should be taking. Use it to manage your business more professionally so that customers learn to be loyal and depend on it more. Memorize all that’s on the retainer agreement sample. Refer to it in case of conflicts too.